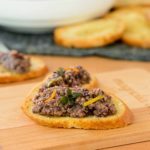 A recipe for citrus herb olive tapenade made with olives marinated in citrus juices and herbs. It is a great appetizer and can also be used in many dishes. Drain the liquid from the Herb and Citrus Olives using a fine mesh strainer. Place the olives, red pepper flakes, and hot sauce in a food processor fitted with a knife blade. Add a 1/4 cup of olive oil. Process to combine until it becomes a coarse paste, stopping to scrape down bowl and adding more olive oil as needed for desired consistency. Garnish with citrus zest and/or fresh herbs.